Can You Handle the (Prophet’s) Truth? I have a friend who can’t stand this one priest. Whenever this priest comes up in discussion, he’s visibly irritated! And, whenever this priest preaches, my friend looks down and puts his hand on his forehead. While a part of this is comical, a part of it is pathetic: My friend’s a Christian, and is missing out on the good things this priest preaches. This hostility can happen to us, right? We refuse to listen to the advice of certain people. There are spouses who don’t listen to each other, but, when I give them the same advice, they do. There are people who have hurt us. Consequently, we choose not to listen to whatever advice they offer. 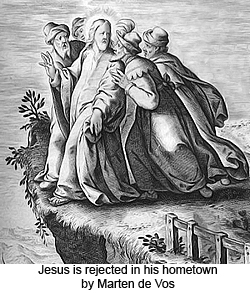 This is similar to what happens in the Gospel: The people of Nazareth reject Jesus because they think they know Him (Mk 6:2-3). After all, He grew up there and they know His parents, His background, and, in their mind, there’s no way He could be speaking with such wisdom. He’s just a carpenter. Now, in this passage, Jesus refers to Himself as a ‘prophet’ (Mk 6:4), and the First Reading is about Ezekiel being a prophet (Ez 2:3-5). A prophet, in the Bible, is not primarily someone who predicts the future; it’s someone who reveals Who God is, shows us His face and the path to take (Pope Benedict XVI, Jesus of Nazareth, Vol. 1, 3-4). In other words, a prophet tells us the truth. However, here’s the challenge: The prophets weren’t perfect and told the people things they didn’t want to hear. The prophets themselves were sinners telling other sinners that they had to change. Because of this, the prophets were rejected. In the same way, God sends prophets, who are sinful, into our lives, but these prophets tell us the truth. We may think we know them: “Why should I listen to them?” Maybe it’s because what they’re saying is true. Prophets are not perfect, but speak truth. This is how God loves us. He will use anyone to help us grow, because it’s for our good. Now, remember, it doesn’t mean everything they say is accurate, because some people will just correct us and be plain wrong. And it doesn’t mean we have to take abuse. What we should do is listen for Jesus’ voice: Is what they’re saying true? We can pray about it and ask other people’s opinions, and perhaps only a bit of it is true. In addition, if what they say is partially true, then don’t reject it, because we don’t want to reject Jesus, Who’s the truth. It says in the Gospel, “Jesus could do no deed of power there… And Jesus was amazed at their unbelief” (Mk 6:5-6). When we refuse to listen to truth, we stop Jesus from doing deeds of power in our lives and stop ourselves from growing. A few days ago, I had an interesting conversation that wasn’t in the original draft of this homily. Two people had the courage to tell me that they didn’t understand why I’ve made certain changes here and why I’m planning on making more; specifically, why I expect so much of our ministries, and why I’ve had to ask some people to step down. They said I should explain to parishioners what I explained to them because it helped. First, I admit I’ve made many mistakes, and some of the ways I asked people to step down were disasters, and I apologize for them, and I want to do everything I can to avoid repeating them. 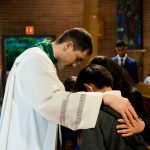 However, the main reason we’re making changes is because, and I’m sorry to say this, I believe the Archdiocese of Vancouver, which includes our parish, is in a crisis. Now does this bother us? This doesn’t mean that people are bad, or that everything we’re doing is bad; there are some great things happening. It simply means that we’ve got huge problems that we have to face. For example, Mass attendance continues to drop every year. 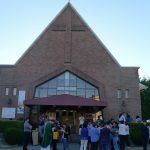 The only reason why churches still have many people in them is because of immigration; Deacon Greg Barcelon said that 50% of the people at Mass on Sundays are Filipinos—if they didn’t immigrate here, our churches would be 50% empty. The number of seminarians is very low; we will not have enough to replace our priests. Put up your hand if you’re between the ages of 22 and 42 years. Look how few of us there are. If you went to a Catholic school, you are among the 9% who still practice their faith. Imagine if we put up a big sign on our 50 Catholic schools and put “9% Success Rate!” Is that a crisis? We cannot stay where we are and we cannot keep on doing things the way we’ve been doing them, because if we continue this way, we’ll keep on getting what we’re getting. Here’s the solution: We listen more to Jesus, to the truth. In the Gospel, Jesus always wants to do great deeds of power! But we inhibit Him by our lack of faith. We think 9% of our children practicing the faith is normal—where’s our faith? “Faith requires that we truly trust in God. Most often, however, our pastoral plans remain entirely in the realm of the safe and what we think is possible. The truth is that it requires no faith at all; we are just trusting in our own strengths… We truly are being unfaithful, because we do not need faith to achieve these goals” (Fr. 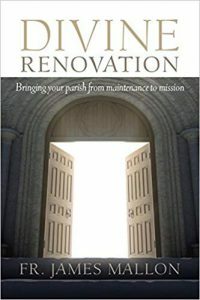 James Mallon, Divine Renovation, 282). Jesus loves everyone and wants to reach everyone. He wants us to go out there and love people, but we always wait for people to come to us. And, when people come to us, what do they find? Are we ready and eager to have guests? You see, if Pope Francis were to come to Vancouver and we were privileged to have him celebrate Mass at our church, and three families here were selected to have their homes blessed by him, and you were one of the ones chosen, would you dress up? Would you be on time? Would we put together our best choir and practice a long time? Would we be enthusiastic to see him? Would we clean up the foyer? This is one reason why our attendance has already increased. Let’s do more of this, as if Pope Francis were coming! I read about a couple who once brought their child to a new church. They had to ask twice where the children’s area was. There were also no signs, it was unsafe, and the young man in charge looked confused when they asked about registration. The couple was not impressed. Another time, the husband visited a men’s group, and the first thing he noticed was that the hall smelled. There was clutter everywhere: literature, Bibles, hymnals, and umbrellas. The carpet needed replacing, and the blinds were randomly opened to various heights. These are the lessons he learned: 1) That church is not expecting guests; 2) What they’re doing there isn’t that important; 3) They don’t take pride in their church; 4) The safety of children is not their highest priority; 5) The volunteers are untrained. He never went back (Andy Stanley, Deep & Wide, Section 4). Let’s challenge ourselves to do the little things well! This is the bigger picture. What we do here might be good enough for us, but let’s aim to make it good enough for people whom Jesus loves and who don’t go come here! Is there any truth in what we’re talking about? Don’t look at the messenger, but listen to the message. The message is Jesus, Who created and loves us, from Whom we ran away, and Who’s calling us back. The message is how can we love Him more, help people know and love Him? There’s a maturity question for us here: When someone criticizes us, do we take it personally? Remember, it’s not only about our feelings, it’s also about truth. I’ve realized that, when I confuse doing something badly with being bad, I’ve got to grow. So I’ve trained myself to disassociate criticism of my faults from criticism of who I am. God calls all of us to do this. 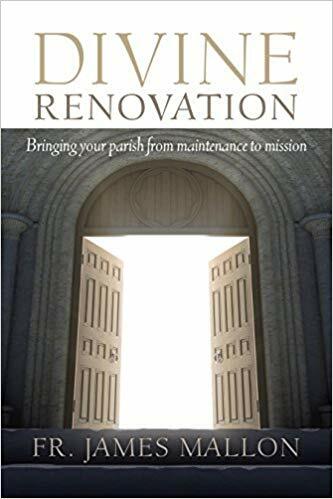 Next week, we’ll talk about God’s vision for this parish, and the direction in which He’s calling us to go. I hope you’ll be here. Let’s finish by celebrating the deeds of power Jesus has already accomplished in our midst: Mass attendance went up in three years from 850 every Sunday to 1080. Everything’s improved at Sunday Mass: the hospitality, lectors, choirs, servers (though they’re not cool), and the ambiance of the sacred. Name Tag Sunday is so much fun! Other parishes have contacted us about Alpha (I love Alpha!) 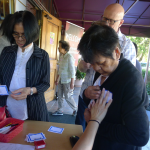 and how we run it now in two locations, including a café—it’s so life-changing that participants donate money to support the program and we always break even. How many heard Richard Wang’s story two weeks ago? That was awesome! And he’s not the only one, people in Faith Studies tell me all the time how their relationship with God and their lives are changing. 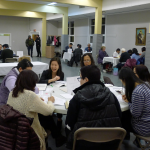 We’re the only parish that has been able to run faith Faith Studies for three years, 12 rounds, and 400+ participants. Archbishop Miller uses this as the model of what he wants to see at other parishes. Sacrificial giving has increased, and people are blown away at the generosity of donations to the Brick campaign. Fr. 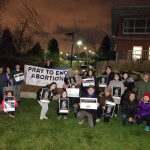 Larry Lynn, the pro-life chaplain of the archdiocese, was amazed that we got over 200 people for two days at 40 Days for Life. We started monthly Praise and Worship adoration, along with all-day confessions and it’s always well-attended. All these things have come because we’ve listened to the message: Jesus Christ. And we need to listen to Him more. We need to listen to the prophets He sends to speak the truth.